Jaquet Droz $367,500 Signing Machine automaton. Four years in the making, the incredible Jaquet Droz Signing Machine — an automata unveiled initially four years ago and then officially at Baselworld 2018 in honor of the brand’s 280th anniversary — is ready for delivery. The incredible mechanical machine will sign your name for you — in case you can’t or don’t want to. 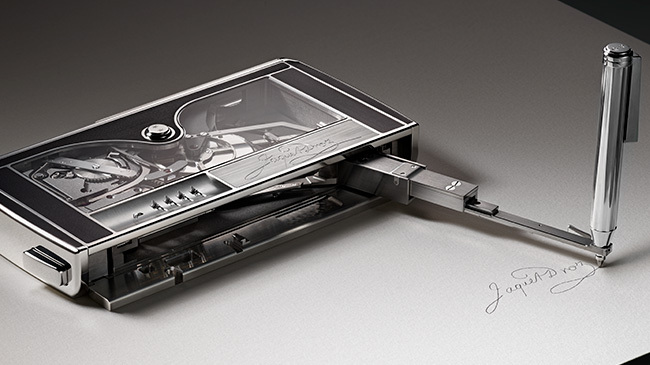 Retailing for $367,500 the Jaquet Droz Signing Machine is definitely for the person who has everything. Jaquet Droz is famed for its work with automatons — and several of Pierre Jaquet-Droz’s 18th century life-size automata dolls are still on display in the Neufchatel Museum of Art and History in Switzerland. Still, it is an art that the master craftsmen at Jaquet Droz today perpetuate. “The Signing Machine” has two patents pending. The automaton movement has been totally reworked for this piece to offer exceptional fluidity in order to execute consistent signatures.The machine’s power reserve enables it to complete two full signatures before needing to be wound by a lever located on the side of the Machine. A total of 585 parts comprise the complex mechanism that is entirely assembled and finished by hand. The mechanical programming of the owner’s signature (imprinted on three cams) is also done by hand. Each signature reproduced by the Machine is unique and personal. In order to use the signing machine, the owner activates it by using his own four-digit code. We were treated to a private viewing of the Jaquet Droz Signing Machine, retailing for $367,500. Here, we share our video with our readers.